SpiceWorld is one of the biggest IT events of the year, focused on helping IT pros master every aspect of their job. They’re also there to learn about the latest business tech and trends and see new innovative solutions that can help them make their business better. Highfive hit the trail to Austin to give SpiceWorld attendees a hands-on experience of our powerful conferencing technology. Over the three days, we engaged with hundreds of IT pros. 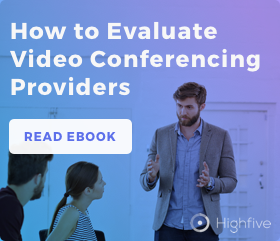 They shared with us their meeting room frustrations, and we watched their eyes light up when they saw how insanely easy video conferencing is with Highfive. Over and over, we heard the same comments, from calling their current video conferencing systems ‘OK at best,’ to being surprised that a better, less-complicated video conferencing system existed. These IT pros were seeing, for the first time, that great hardware and software can be combined to deliver better business collaboration that’s light-years beyond what most are using today. Features that ease the conferencing process, like Highfive’s simple click-to-join calls and how Highfive clearly captures what’s written on whiteboards, got plenty of oohs and aahs. One of the biggest benefits of Highfive is our easy setup. We tout that any meeting room can be set up in mere minutes, and that’s no joke. To prove it, we held the Highfive Setup Challenge in our booth to see who could unbox and connect a Highfive video conferencing system the fastest. The winner, Rashad from The Reynolds Company, set up his system in just 1 minute, 10.99 seconds! Now think about how long it took you the last time you had to setup a video conferencing meeting room system. Yeah, probably a lot longer than a minute! The reason for the exceptional audio experience is that the Dolby Voice codec is integrated into every level of Highfive’s conferencing system. This means every Highfive meeting—on any device—benefits from Dolby’s exceptional audio clarity and crispness. With Highfive and Dolby, stunning audio allows our meeting participants to communicate and collaborate more effectively, eliminating the major issue of poor audio quality typically found in other conferencing systems. Spiceworld attendees were in awe. The highlight was when a professional sound mixer asked us to share our secret to achieving such incredible sound quality. The answer is simple: our partnership with Dolby Laboratories, the world leader in audio. After attendees experienced what was possible with our integrated audio-video platform, they mentioned how disappointed they were with their current systems or how far behind those vendors were from what was really possible. The quality of Highfive’s video and audio changed their expectations, as did the modern user interface and top-of-the-line hardware. To learn more about Highfive Premium, click here or experience Highfive for yourself. Sign up for a trial today.